The Nagorno-Karabakh conflict between Azerbaijan and Armenia escalated on Thursday leaving several military dead. Different figures were produced by each side, ranging from at least three, up to 20 people in the disputed enclave in the South Caucasus. The defense ministry of the Nagorno-Karabakh Republic, which is an unrecognized state populated mostly by ethnic Armenians and completely surrounded by Azeri territories, reported that three of its servicemen were killed and several others injured in an attack from the Azerbaijan side on Thursday. “On Thursday morning a reinforced group of [Azerbaijan's] special operation forces attacked the Karabakh positions,” the ministry said in its statement, adding that the Armenian soldiers serving in that region repelled the attack and “totally defeated” the military group. Three Armenian servicemen died in the fight, and four more were injured, the ministry's press-service said. The Azerbaijani side called these reports intentional “disinformation,” and said that its troops killed and wounded up to 20 Armenian military. 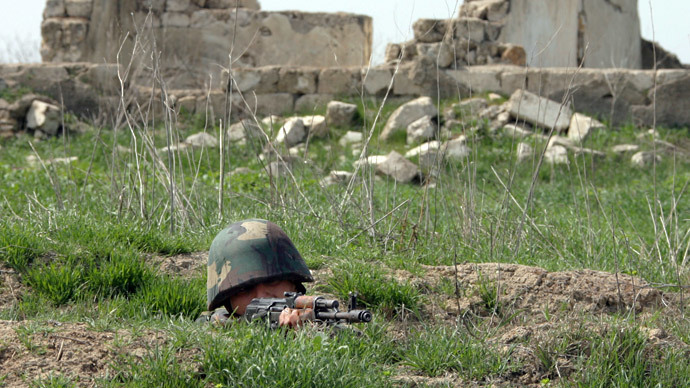 “As a result of military clashes on March 19 on the front line, Azerbaijan's armed forces conducted a heavy attack up-front on the Armenian side, and eliminated and wounded up to 20 Armenian servicemen,” the Azerbaijani defense ministry said in its statement. The ministry also said that reports of a sabotage attack from the Azerbaijani side were not true. The Armenian Foreign Ministry blamed its opponent for a “provocation,” which “poses a serious threat to security and stability in the region,” the ministry's spokesman Tigran Balayan told journalists on Thursday, as quoted by Interfax. Both sides have repeatedly accused each other of trying to reignite a conflict that broke out in 1988 when the Nagorno-Karabakh region announced its plans to seek independence from Azerbaijan and become part of Armenia. After Armenia and Azerbaijan obtained independence from the Soviet Union in 1991, Nagorno-Karabakh held a referendum, which approved the creation of an independent state. Azerbaijan made an attempt to regain control over the territory and the conflict quickly escalated into a full-scale war, which saw 30,000 people killed over three years. Although the sides announced a ceasefire in 1994, there has been no lasting peace agreement since, with the Nagorno-Karabakh Republic remaining an unrecognized state, with Armenia generally representing its interests. In August 2014, relations between Azerbaijan and Armenia deteriorated into the worst crisis since the beginning of the century, with 13 Azerbaijani soldiers and five Nagorno-Karabakh troops killed in the escalating confrontation.